As you can see I used her sketch and took creative liberties - changing her focal image to a square to fit my stamped image, and changing the size of her circles by using Build a Brads. I stamped the skull image from Stampin' Up! 's From the Crypt in Black on Pumpkin card stock. I used the Torn Frames Technique on the Black panel behind the image, then layered it onto a piece of Cast-a-Spell DSP. 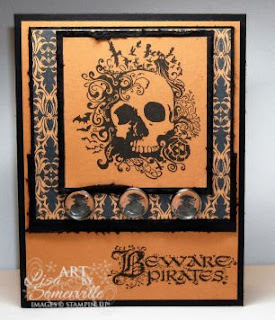 The Pirate is from Beware Pirates, stamped in Black on Pumpkin, then punched with the 1/2" Circle Punch and adhered to the Build-a-Brads. He is definetely handsome, is he married? lol Luv what you did with the layout and card. Love your liberties, it looks great! I love the black on orange! Love this Lisa. I really think this is the most fun Halloween set ever! Thanks for playing along! What a fabulous Halloween card this is! Great take on the sketch....really showed off your image in this layout!